In a snapshot of the endlessly varied forms of musical expression throughout our community, the 22 musicians of Contemporaneous will host a non-genre musical gathering with performances by some of the most powerful artists working amongst us – daring avant-rock band Boio, the genre-obliterating Warp Trio, and Forward Music Project, Amanda Gookin’s multimedia project of solo cello works developed to empower women and girls. Contemporaneous is an ensemble of 22 musicians whose mission is to bring to life the music of now. Recognized for a “ferocious, focused performance” (The New York Times) and for its “captivating and whole-hearted commitment” (I Care If You Listen), Contemporaneous performs and promotes the most exciting work of living composers in innovative programs throughout the United States. The ensemble has been presented by such institutions as Lincoln Center, Park Avenue Armory, PROTOTYPE Festival, MATA Festival, and Bang on a Can, and has worked with such artists as David Byrne, Donnacha Dennehy, Dawn Upshaw, and Julia Wolfe. Contemporaneous has premiered more than 150 works, and with its newly-launched program Contemporaneous IMAGINATION, the ensemble champions large-scale works, curated from an open call for artists to submit ideas for projects that take risks and defy constraints. The ensemble has recently released the first season of its new podcast Imagination Radio, which explores the significance of creativity and music in our lives through dialogues with composers, scientists, a cartographer, and a BASE jumper. 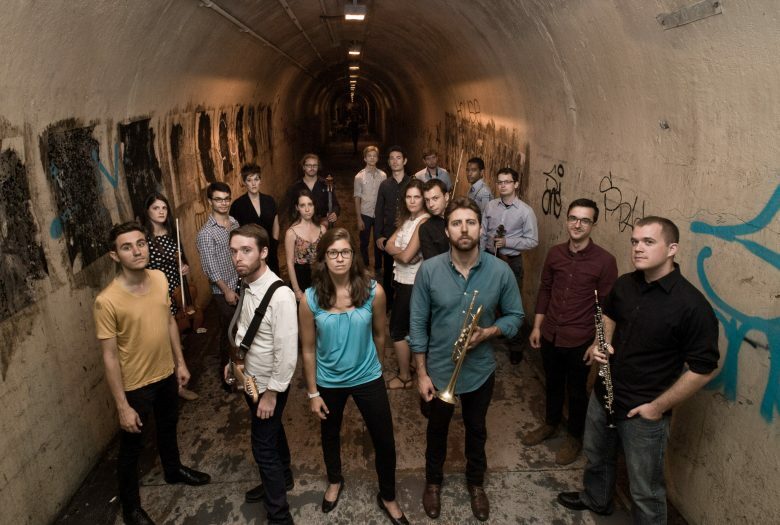 Contemporaneous has recorded for the New Amsterdam, Cantaloupe, Innova, Roven, and Navona labels and has held residencies at such institutions as City University of New York, the University of New Orleans, Williams College, and Bard College, where the group was founded in 2010. Read more at contemporaneous.org. Sarah Goldfeather is a Minnesota born, Brooklyn-based composer-performer and the bandleader for her eponymous band, Goldfeather, the founder, artistic director and violinist of the seven-piece new music ensemble, Exceptet, and one half of the soprano-violin duo, Cipher. Goldfeather’s music has been described as “full of light and life” (The Current, Minnesota Public Radio) and “distinctive…whimsical” (The Boot). She has performed as a soloist in Madrid, Valencia, Berlin, and the TEDxMET series at the Metropolitan Museum of Art in New York, among others, and has worked closely with such artists as Julia Wolfe, Steve Reich, Timo Andres, Chris Cerrone, Ted Hearne, Andrew Norman, Kishi Bashi, Todd Almond, and Courtney Love. Boio is a two-boy avant-rock band from Brooklyn, NY. Forward Music Project is driven by social justice for girls and women. The project has commissioned twelve of today’s most forward-thinking composers to write pieces for solo cello, each based on a personal story or an issue the composer wants to bring to light. The stylistically contrasting compositions represent the vast definition of the female experience; ranging from issues of the LGBTQ+ community to reproductive rights to sexual violence and empowerment. A visceral experience, the composers require cellist Amanda Gookin to embody the spirit of their message physically, mentally, and emotionally, ultimately encouraging social change and empowerment for women and girls. Described as “a talented group that exemplifies the genre-obliterating direction of contemporary classical music (Columbia Free Times),” Warp Trio is an internationally touring cross-genre chamber music experience. Reflecting the combination of Juilliard trained musicians juxtaposed with musicians steeped in rock and jazz styles, this one of a kind trio can be seen performing classical works in prestigious halls on the same tour where they headline a standing-room-only show at a rock venue. In addition to their electrifying public performances, they have gained a reputation for their innovative educational workshops with students from grade school through university level. Contemporaneous is supported by the New York State Council on the Arts with the support of Governor Andrew Cuomo and the New York State Legislature. Contemporaneous is a member of New Music USA’s Impact Fund, made possible with funding from The Sherman Foundation’s Katharine S. and Axel G. Rosin Fund.